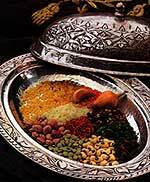 For those who engaged in culinary pursuits, the Turkish Cuisine is a very, curious one. The variety of dishes that make up the Cuisine, the ways they all come together in feast-like meals, and the evident intricacy of each craft offer enough material for life-long study and enjoyment. It is not easy to discern a basic element or a single dominant feature, like the Italian "pasta" or the French "sauce". Whether in a humble home, at a famous restaurant, or at a dinner in a Bey's mansion, familiar patterns of this rich and diverse Cuisine are always present. It is a rare art, which satisfies your senses while reconfirming the higher order of society; community and culture.